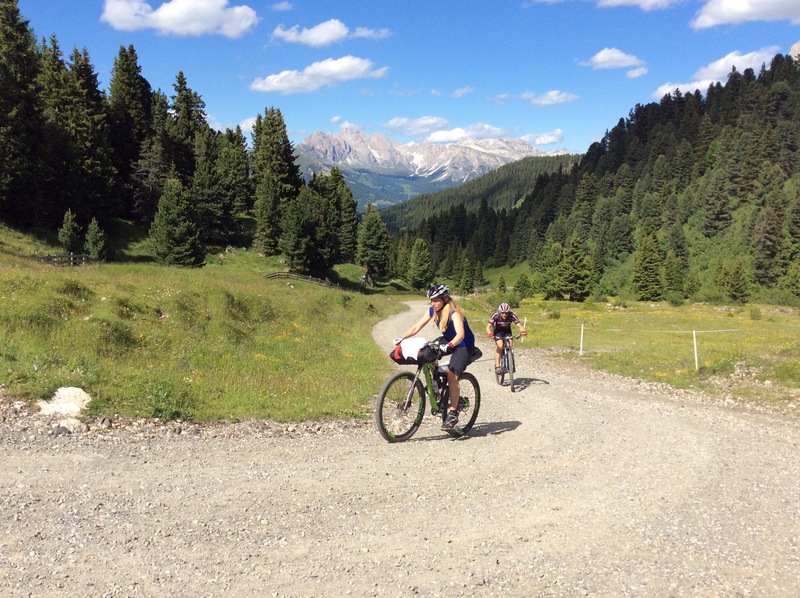 From one extreme to the other in the Italian Dolomites. Doesn’t sound like me does it? 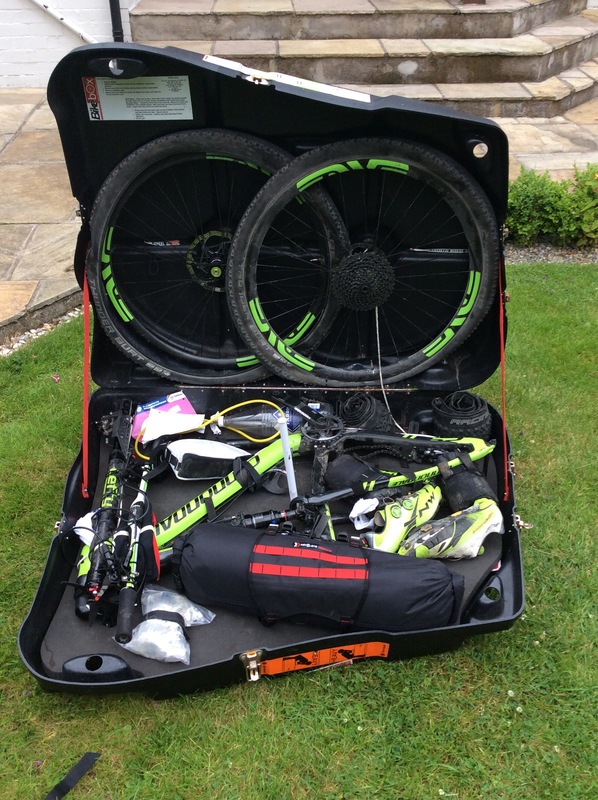 For fear of undercomplicating my packing for this trip, I decided to combine a World Championship Mountain Bike event, a self supported bike packing trip and The Dunwich Dynamo. I proved my theory that whatever time you set yourself to pack, you will fill it. Thus allocating an entire day wasn’t clever. I would have achieved the same level of disorganisation had I allowed myself an hour. But I’m writing this post race so against all the odds, I seem to have pulled off at least the most complicated component of my over ambitious schedule. Last Thursday, I packed my Cannondale Scalpel into my bike box and padded it lovingly with my tent, sleeping bag and thermarest. 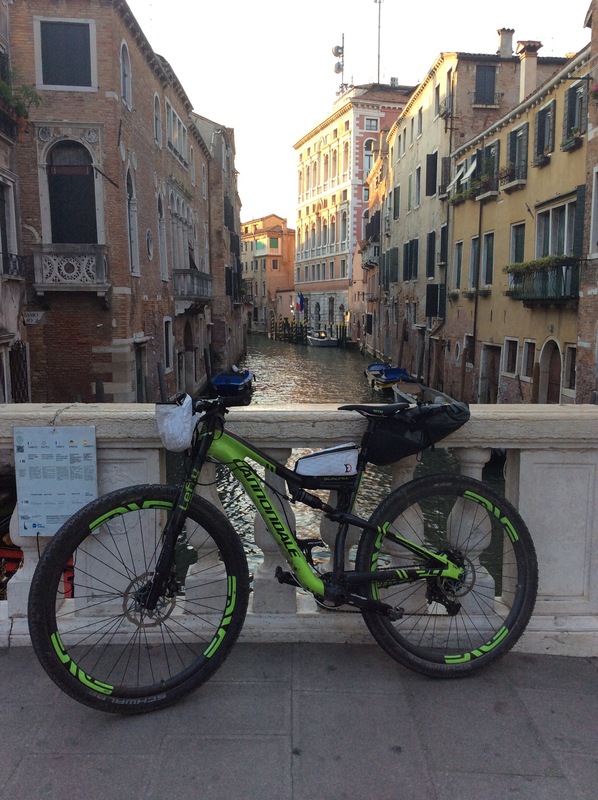 I then drove to Manchester (with the briefest of stops in Glasgow to gaze at my nephew and pick up a ridiculously small chainring in order to get up the sheer sided Dolomites) and made my early morning flight to Venice the following day. 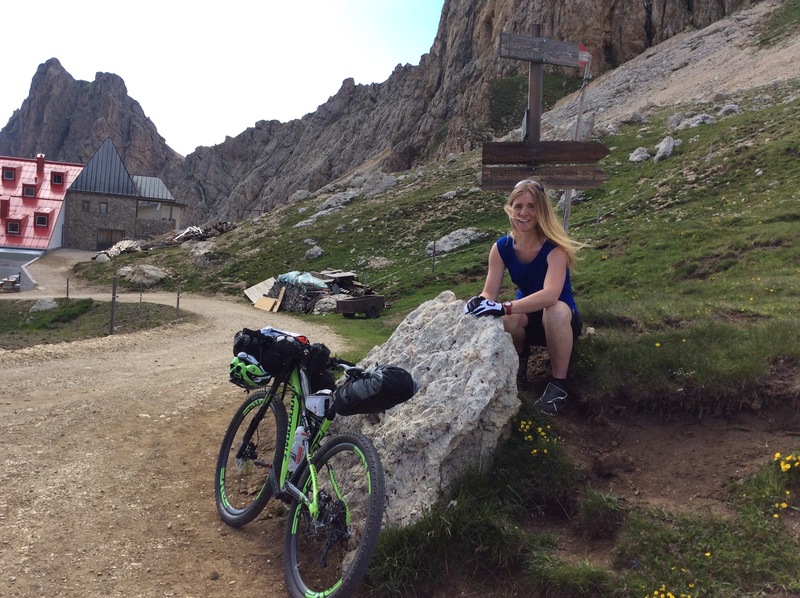 Getting to Selva de Gardena was made easy by the generosity of Nienke and Micheal who had hired a car and gave me and my box a lift into the high Dolomites. I pitched up at my accommodation, also made easy by being welcomed amongst the group of GB marathon riders Will Hayer, Tim Dunford and Mel Alexander. It is a rare thing for me on a race weekend to have my transport, accommodation and food all taken care of as a result of the forethought of others. Usually I’m the one scrabbling about booking and cooking for everyone but amongst this high functioning group of lovely people (perhaps not incidentally all born in 1978) the first part of my trip was made easy. The next part – the racing part- was not to be quite so. 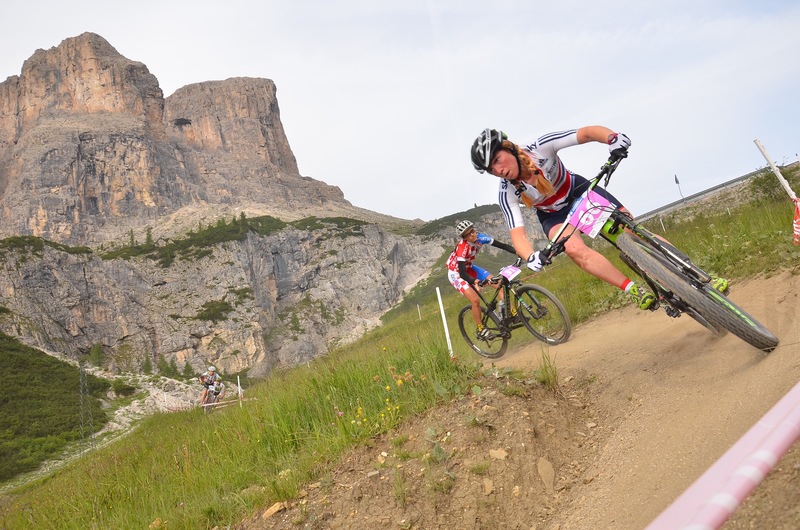 With a hammering heart I stood on the start line of the World Mountain Bike Marathon Championships in my GB kit wondering 1. if my heart was hammering more from the altitude than the nerves and 2. what the hell I was doing here. I have retired you see. 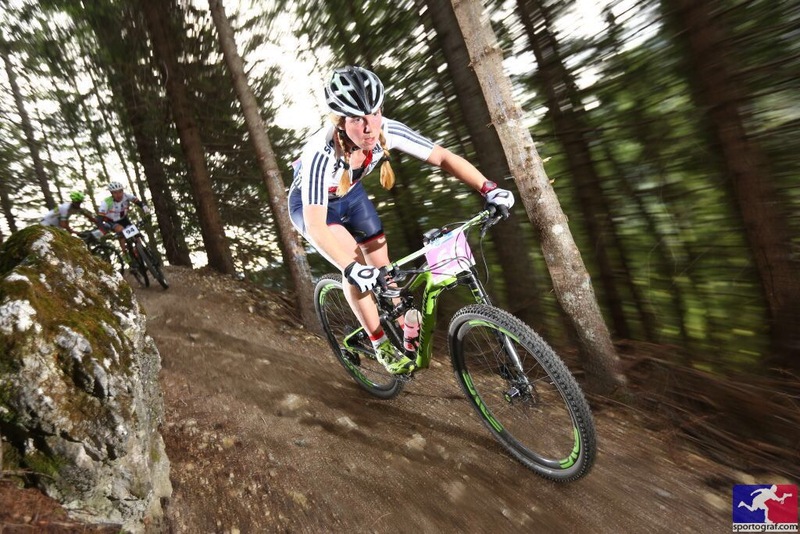 Left the hard racing all behind and am interested purely in the fun and adventure to be had on a bike. 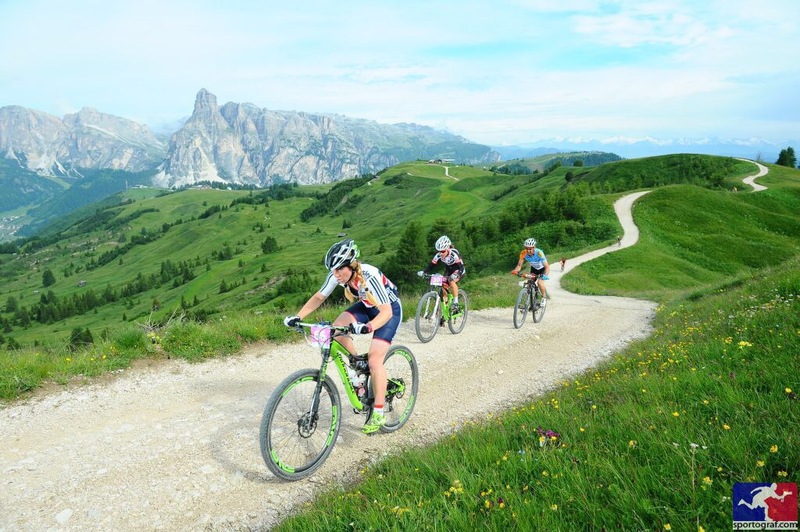 I managed to remind myself of the spirit in which i intended to race this event just before the gun announced 72 of the best female marathon riders in the world were to do battle. And what a battle. If I hadn’t adjusted my mindset before the off, I reckon I might have blown on this course. The field was classy. 3 world champions and a host of top 20 world ranked riders smashed themselves up that first climb while I wound up into the pain and discomfort that would accompany me over the next 4.5 hours. 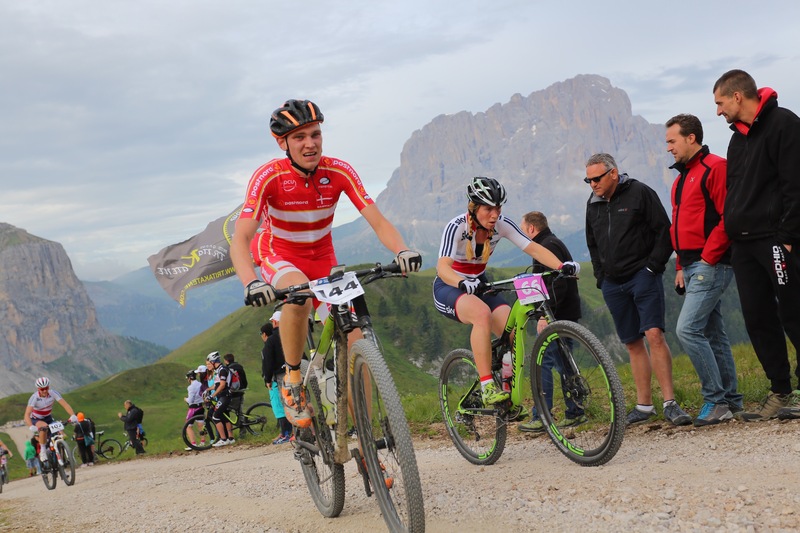 The race went something like this: up, down, up, down, uuuuup, down on a breathtakingly beautiful route right round the Sellaronda mountain range. We ascended 3500m in 62km and not one metre of it was easily won. On the final climb, when I couldn’t actually keep my front wheel on the ground and a damaged hamstring threatened to cramp irreversibly, I actually climbed off my bike and, using it like a very expensive rolling crutch, inched my way to the top. 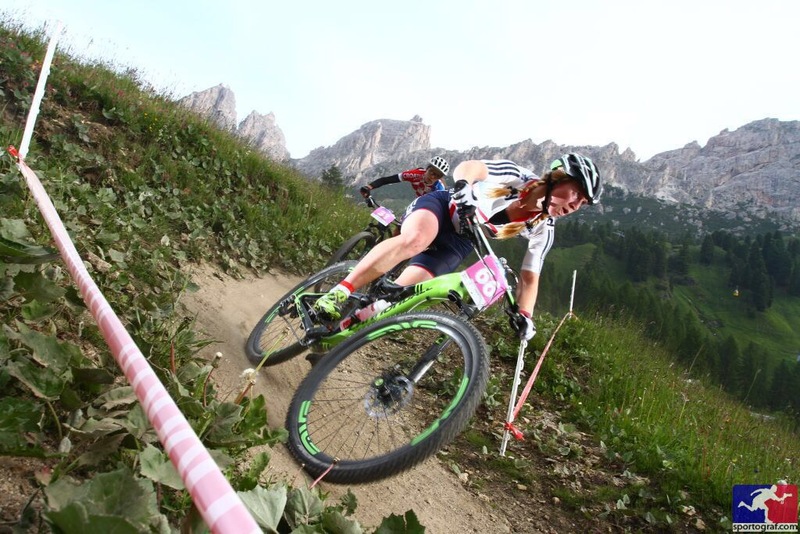 I nursed my exhausted body back to Selva, still managing to make up time on the technical descents on my luscious full suss, then collapsed over the line in a heap of grubby relief. I finished 35th from a gridded position of 66 which I was surprised and delighted by. Gelato was promised among the GB riders to anyone who beat their start number so I was quids in thanks very much. My team mates had mixed fortune. Tim had bad luck to contend with by way of punctures and failing brakes and Rachel’s bike fell apart at exactly the furthest point from home but Mel, Will and Nienke (racing for Holland) completed the tough race in style adding international racing miles to the experience bank. 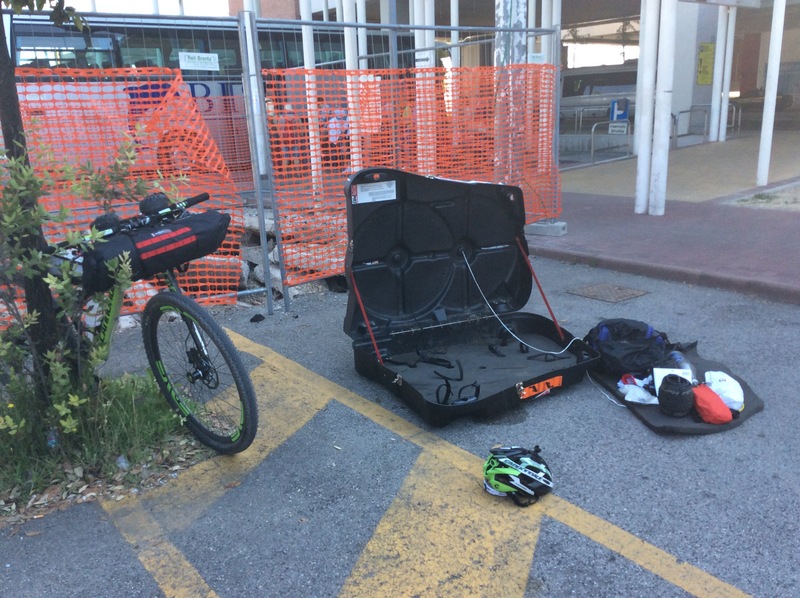 The next day, after replacing our calorie deficit with traditional Tyrolean food, I packed down my camping kit and threw all things race related into my bike box to be stowed at the airport by Nienke and Micheal. 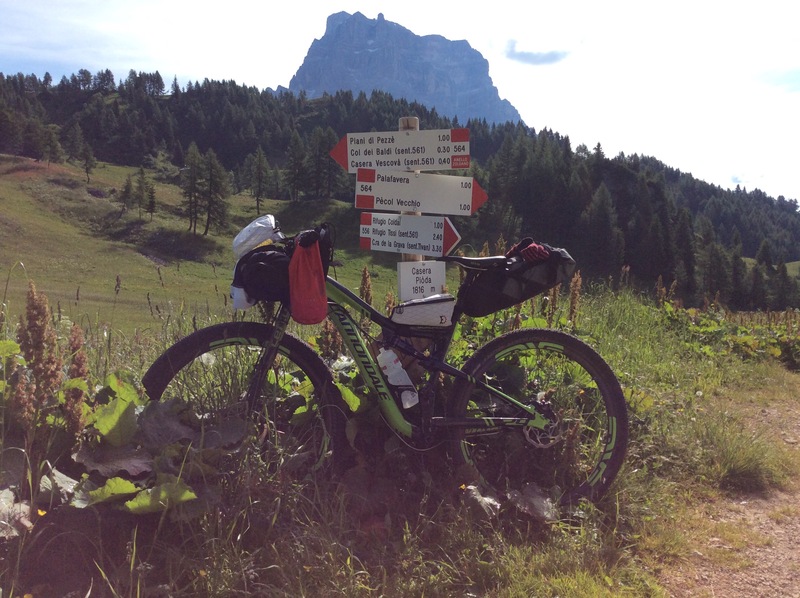 I set off on Sunday morning through the middle of the Sellaronda range with everything I needed in life firmly strapped to my bike in my Revelate bike packing bags. 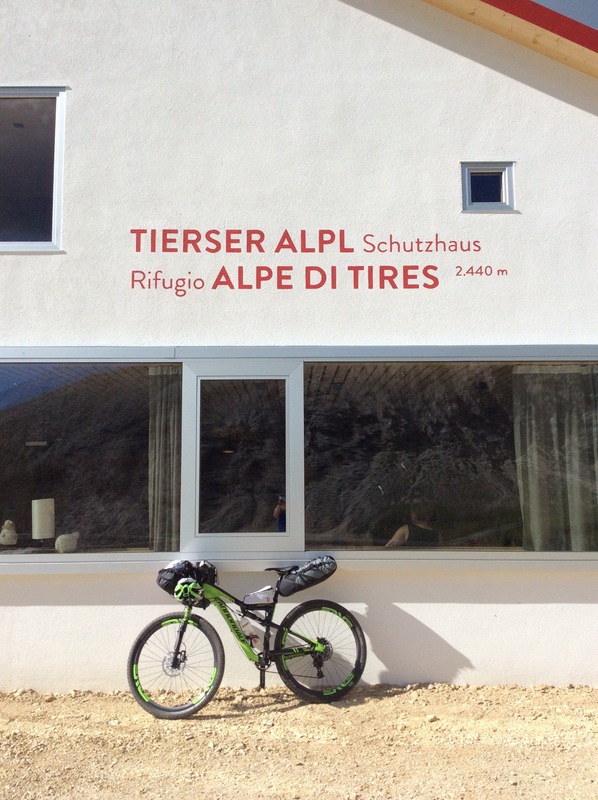 Together with Richard and Cat (friends from Scotland who were out on holiday and who had ridden the Sellonda Hero- what I did but over 87km instead and FOR FUN) we made our way high into the hills and the Refugio Alpe di Tires at 2440m. Cat and Rich stopped the night here while I carried on to find an area of 6 square feet of ground not at a ridiculous angle that I could pitch my tent on. I found 4 square feet nestled at the foot of a vertical limestone pitch by a glacier melt stream and contented myself with that. 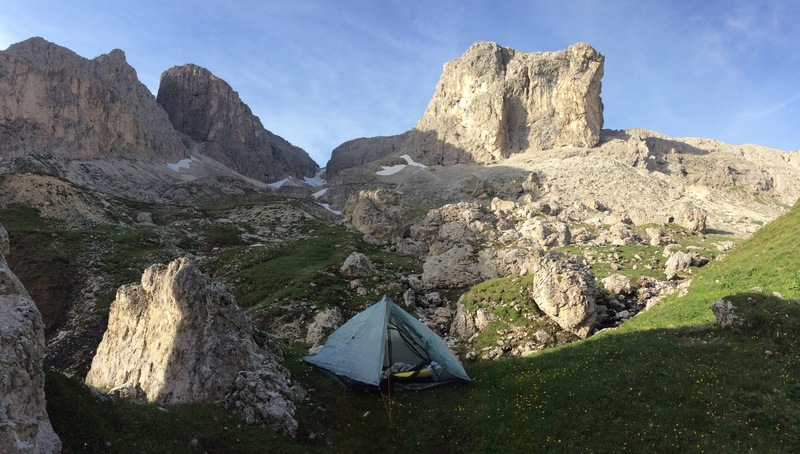 In the morning, with Cat and Rich having descended already while I contemplated the alpine flowers and took pictures of my tent (I love my tent), I followed their route eventually dropping down to the other side of the Sellaronda before tackling a 1000m road climb. I felt so happy on that climb. Dreamily tired, content and excited about all that lay out there for me to explore. I navigated by instinct with my only agenda being to head vaguely south in order to be at Venice airport for my flight in 4 days time. I planned on stretching my time in the mountains to its maximum before hitting the hot flat Venitian plains. And this I did. I think I found the hardest, steepest passes to climb and the most remote, technical singletrack to descend anywhere in the mountain range! I mostly rode within myself though, aware that a mistake out here alone could be costly and wondering why, having spent £250 on a Spot tracker earlier in the year, I had completely failed to bring it along. The feeling of euphoria you get from surviving an impromptu surf down scree on your feet while propped up by your bike is second to none. The realisation that the faint trail you’ve been descending is getting progressively more well defined and flowing is the finest feeling in the world. 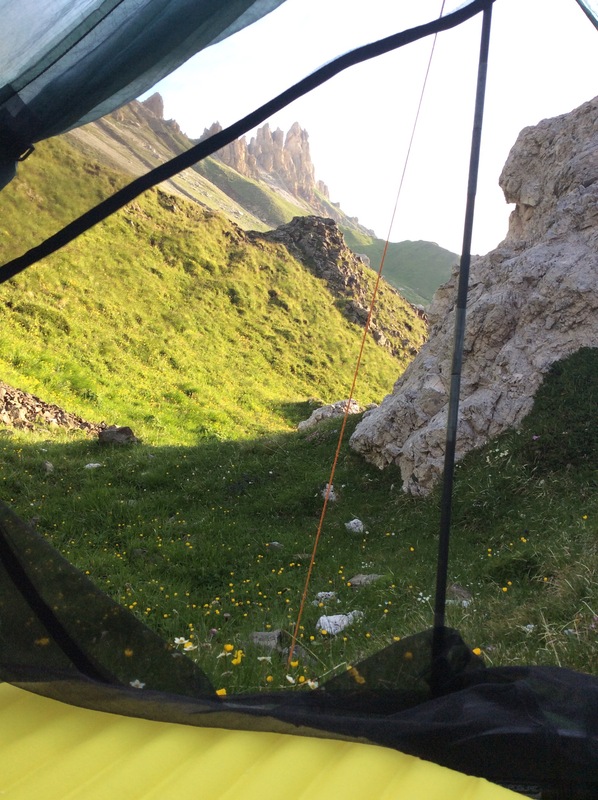 Finding a flat meadow hanging in a high valley and strewn with wild flowers just as dusk is approaching fills up the heart to bursting so that when you have cooked your dinner on your little stove and put up your tent, you’re almost weeping with happiness. This is it. This is why. I wiggled my way south in a very indirect way unable to resist the pull of squiggly cols with tempting off road descent options until eventually the only option was to head for the sea on flat, hot, confusing roads. I felt really sad leaving the mountains. I had to resist all my instincts to turn around and pedal back up into them. Up there surprising pockets of vital life sprung from austere white rock faces, the air was cold and crisp, the water would take your breath away having just returned from its ice locker, the sun cast its rosy glow on distant jagged peaks each evening and every morning the cold dawn promised more sharp life affirming possibilities. But back amongst the roar and heat of the traffic I found a a campsite tucked away from the road and near the airport. I pitched my tent one last time and rode into Venice to console myself with pizza and beer. After an evening of wandering the maze of streets in this strangely quiet city, I found I had been successfully distracted from my feelings of loss at having left my mountains behind by the golden evening light bouncing off the tops of buildings and scattering in shards on the liquid streets. 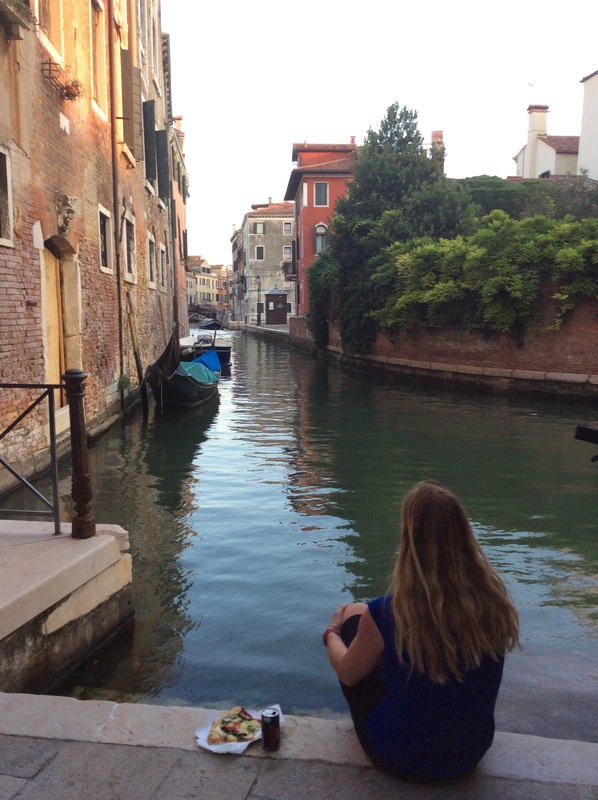 I ate a slice of pizza by the water and watched bored boatmen propel tourists brandishing their selfie sticks then hopped on my bike and rode leisurely through the silky evening air back to my little tent. 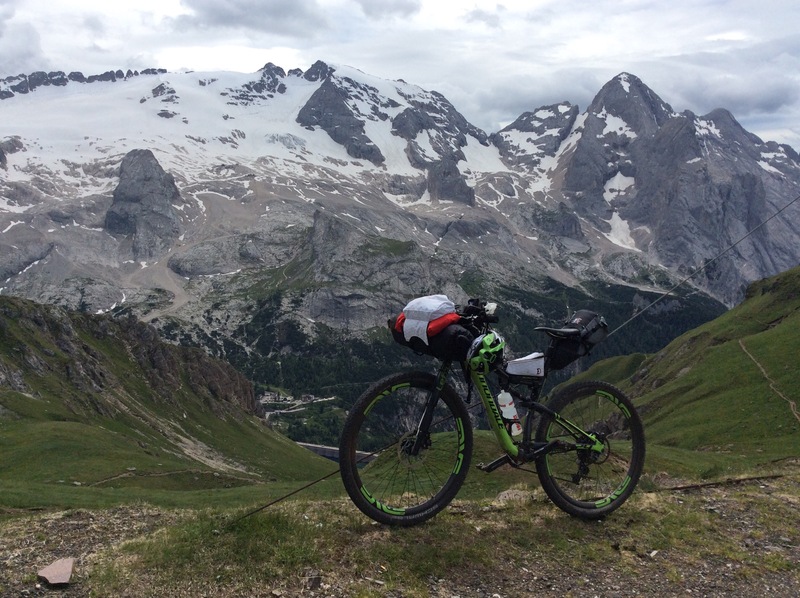 The entire race and bikepacking trip had gone without a single hitch and had been so easy that I wasn’t surprised to find myself lost on the way to the airport the next morning. It turns out that if you follow signs to “airport” in Venice you get spat onto the Autostrade, a place nobody wants to be on a bicycle let me tell you. I survived however and arrived at the airport with just enough time to break my bike down and pack it into the box left for me a few days previously. It was 8.30am and so hot I was wiping the sweat out of my eyes as I wrestled my bike into its box in a corner of the airport carpark.